In this momentous final book in the “New York Times” best-selling series, the prophecy surrounding Percy’s sixteenth birthday unfolds. And as the battle for Western civilization rages on the streets of Manhattan, Percy faces a terrifying suspicion that he may be fighting against his own fate. 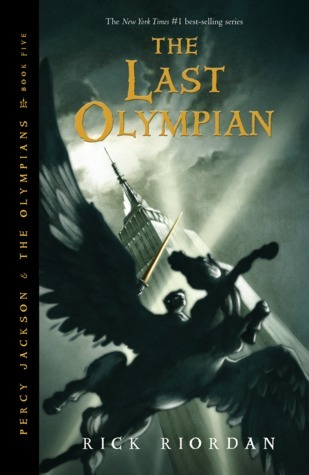 The 5th and final book of the Percy Jackson and the Olympians series! In this book we finally read about the final battle between the Gods of Olympus and the Titans! The prophecy we’ve been hearing about since the first book of the series is finally being fulfilled and many of the questions that were formed in the previous books are finding an answer. This final book of the amazing Percy Jackson series is really full of action! For me that was both possitive and negative. I liked the action and it made me turn the pages faster, but I really missed the more calm days (not that there were a lot of them in this series) as well as the half-blood camp. Generally, though, I really did enjoy this book (as all the others in this series) and I actually think that it could be a bit larger. I would definitely enjoy reading about some things in more detail, or having a few extra pages in the ending of the book!